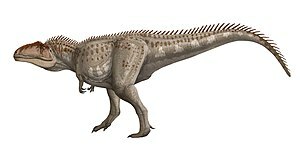 ^ Coria RA & Salgado L. A new giant carnivorous dinosaur from the Cretaceous of Patagonia. Nature. 1995, 377: 225–226. ^ Seebacher, F. 2001. A new method to calculate allometric length-mass relationships of dinosaurs. Journal of Vertebrate Paleontology 21(1): 51–60. 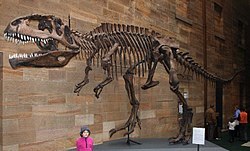 ^ Calvo, J.O., and Coria, R.A. (1998) "New specimen of Giganotosaurus carolinii (CORIA & SALGADO, 1995), supports it as the as the largest theropod ever found." 互联网档案馆的存檔，存档日期2008-02-16. Gaia, 15: 117–122. ^ David Lambert, Darren Naish, Elizabeth Wyse. Encyclopedia of Dinosaurs and Prehistoric Life. Dorling Kindersley Publishers Ltd. 2002. ^ Coria RA & Currie PJ. A new carcharodontosaurid (Dinosauria, Theropoda) from the Upper Cretaceous of Argentina (PDF). Geodiversitas. 2006, 28 (1): 71–118. （原始内容 (PDF)存档于2009-06-22）.